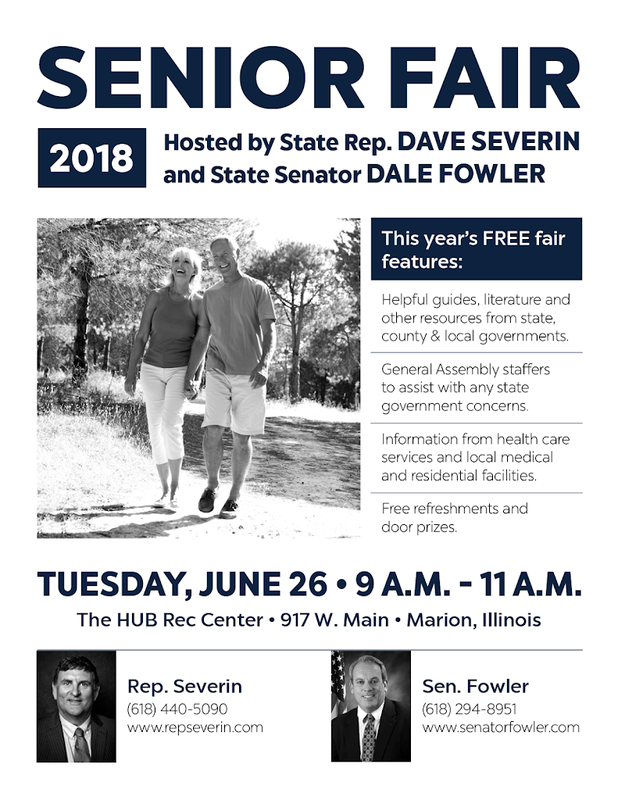 State Representative Dave Severin and State Senator Dale Fowler will host a Senior Health Fair at the HUB Rec Center, 917 W. Main, Marion, IL on Tuesday, June 26. 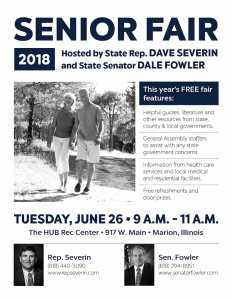 The event will feature vendors that will assist with a variety of health screenings and provide information on various services available to area seniors. Doors will open at 9:00 a.m. and the event lasts until 11:00 a.m. Door prizes and refreshments will be available. For those seniors wishing to participate in blood sugar and cholesterol screenings, please note that an 8 hour fast is required in order to receive testing. For more information, please call Sen. Fowler’s office at 618-294-8951 or Rep. Severin’s office at 618-440-5090.